Notice anything in that photo that would explain my animated rose? 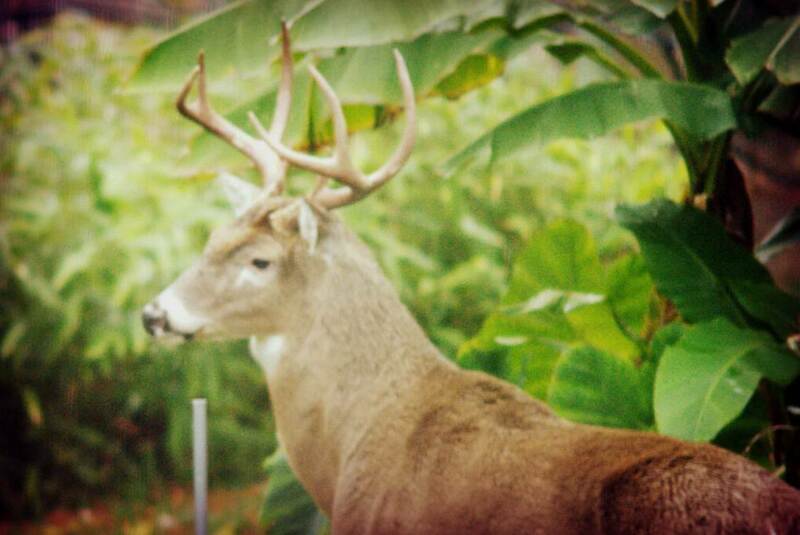 Yes, it's another deer! 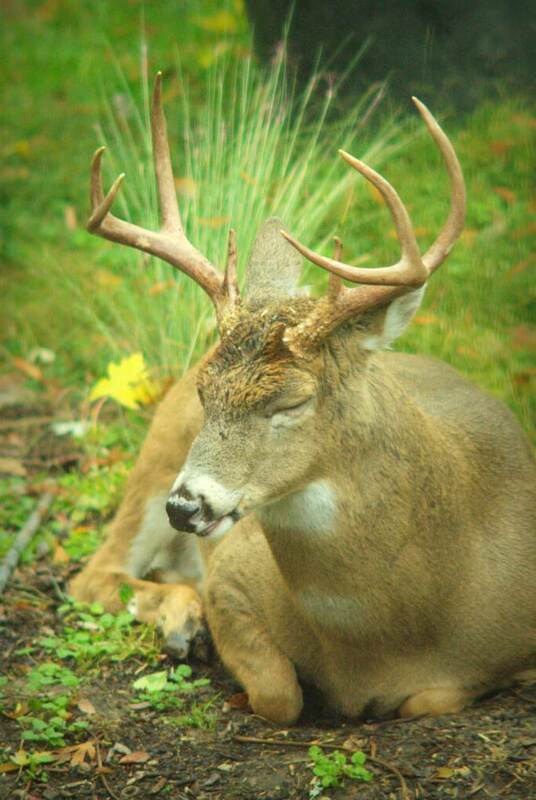 What is it with the middle-of-the-day deer visits lately? 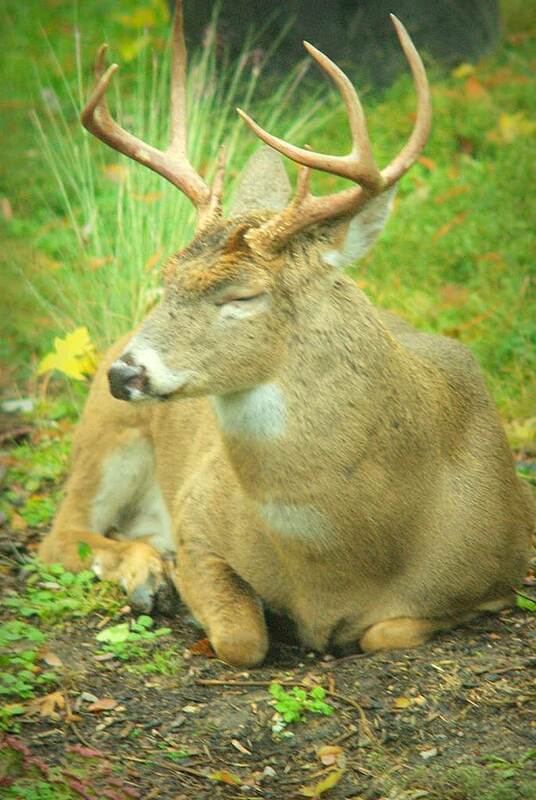 This one is older than the first one I posted about, but he seems just as comfortable in my yard as the other was. In fact, he's too comfortable, but I'll get to that in a minute. In these next two shots he moved behind a cloud of steam from the clothes dryer, so I went heavy with the artistic filters because I didn't want to throw these blurry, steamy shots away. 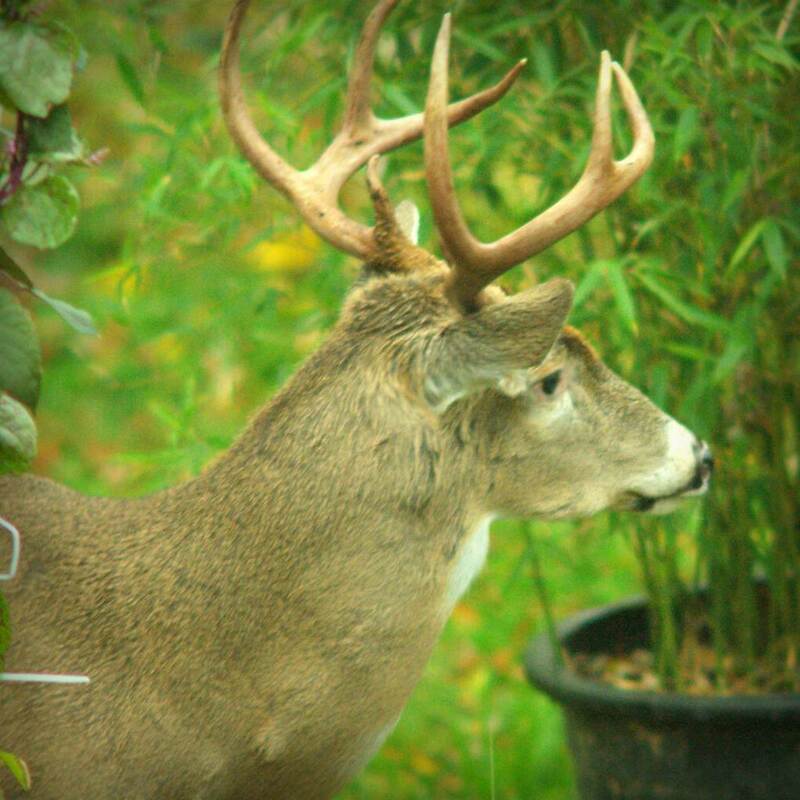 Deer, bananas, and bamboo -- a natural combination? That's the other side of the house -- how did he move so fast? 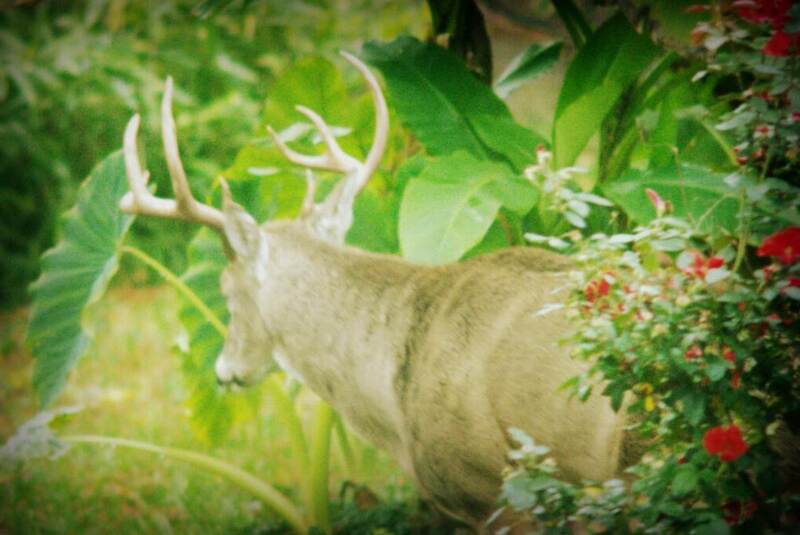 I then saw him moving into my neighbor's backyard, so I thought my photo opportunity was over. I put away the camera, walked back to the living room, and saw him again. How is he moving around so fast? Like I said earlier, he was much too comfortable! It looks like he may have something wrong with him, as his eyes don't look completely healthy. Is the reddish hair on his head normal coloring, or is it blood? In any case, he had a little rest and moved off shortly after -- I didn't watch him for more than a couple of minutes. 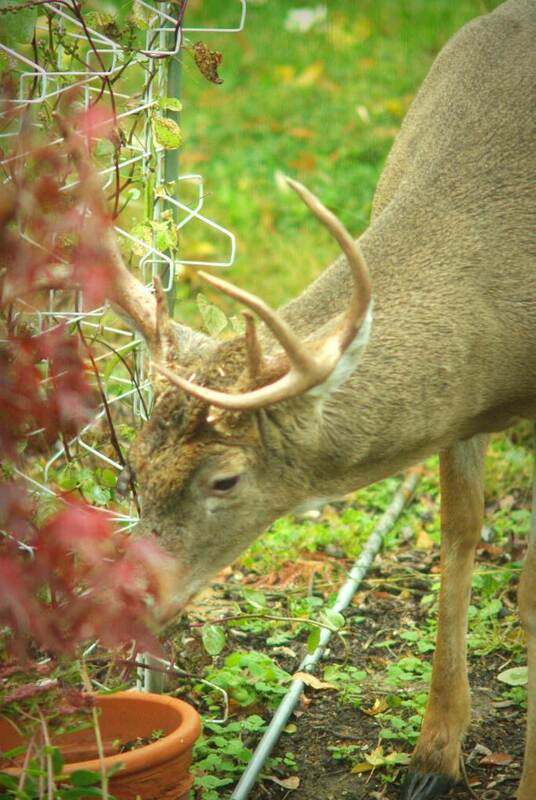 Although deer do a lot of damage to many people's gardens, in my yard they only nibble roses once in a while. Is it because I have so much variety that they just take a bite here and there? Is it the sacrificial Euonymous I have growing back there that they focus on? Whatever the reason, they don't bother my garden too much so are welcome to visit. I prefer seeing them napping here rather than feeding though. 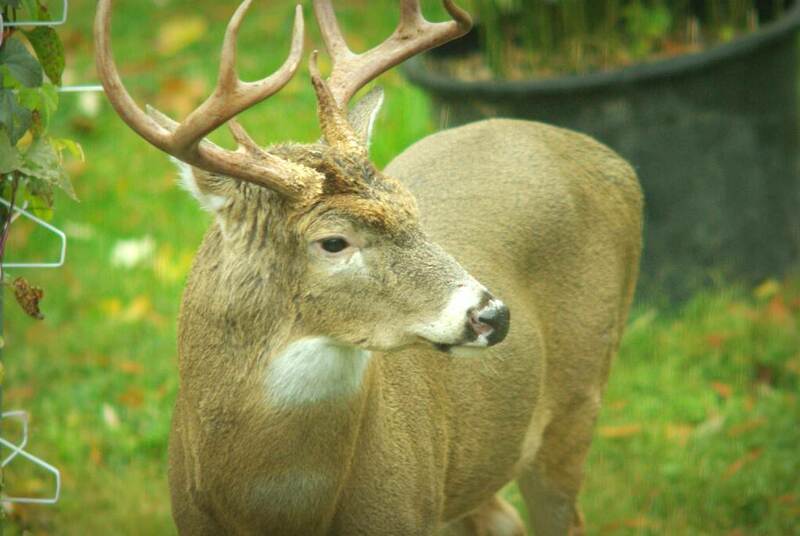 It is breeding time for whitetail deer in your area. 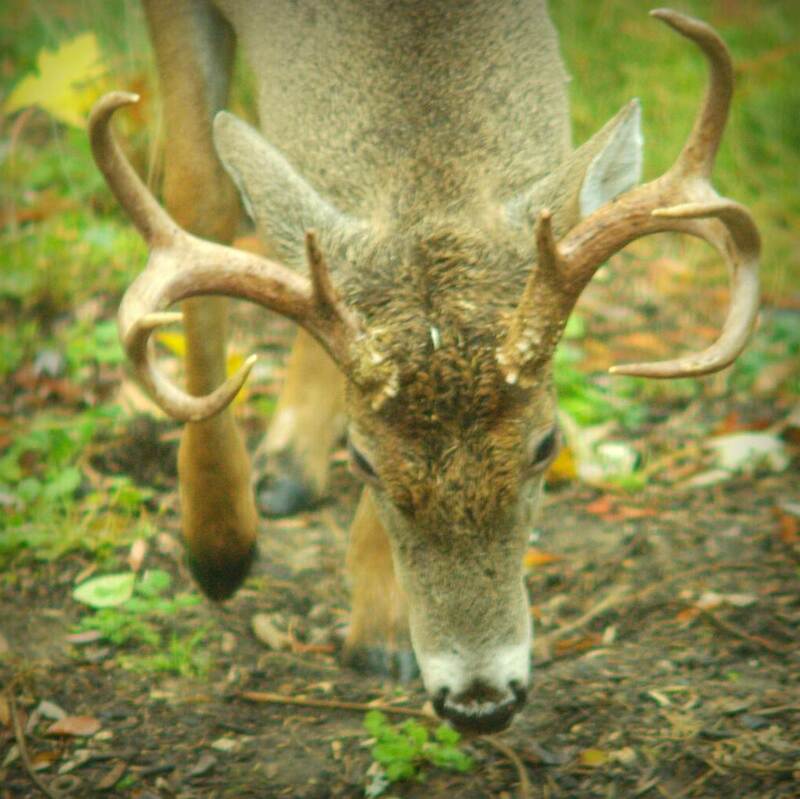 Daytime activity peaks for bucks at this time. They are all over the place scent-checking for estrous does. They also frequently fight each other during this time ... sometimes to the death. Eyes are often "put out," and blood is not uncommon at all in the facial area. 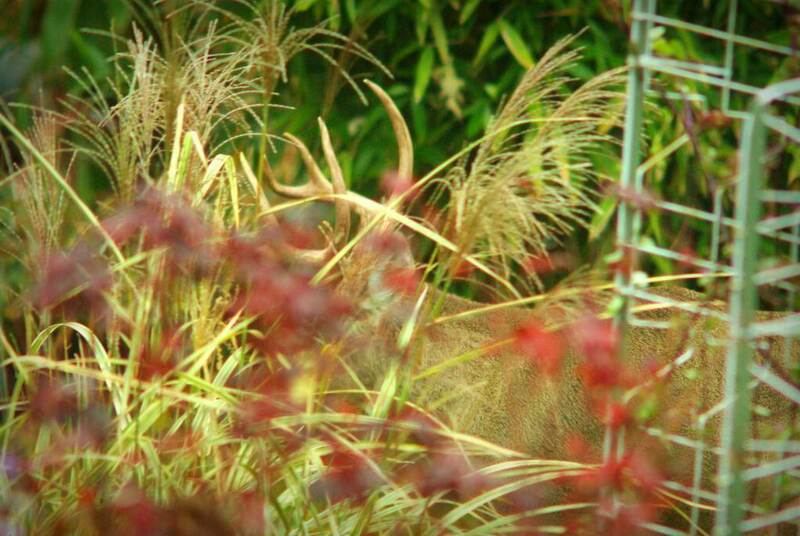 You probably have an estrous doe somewhere in the vicinity of your house. 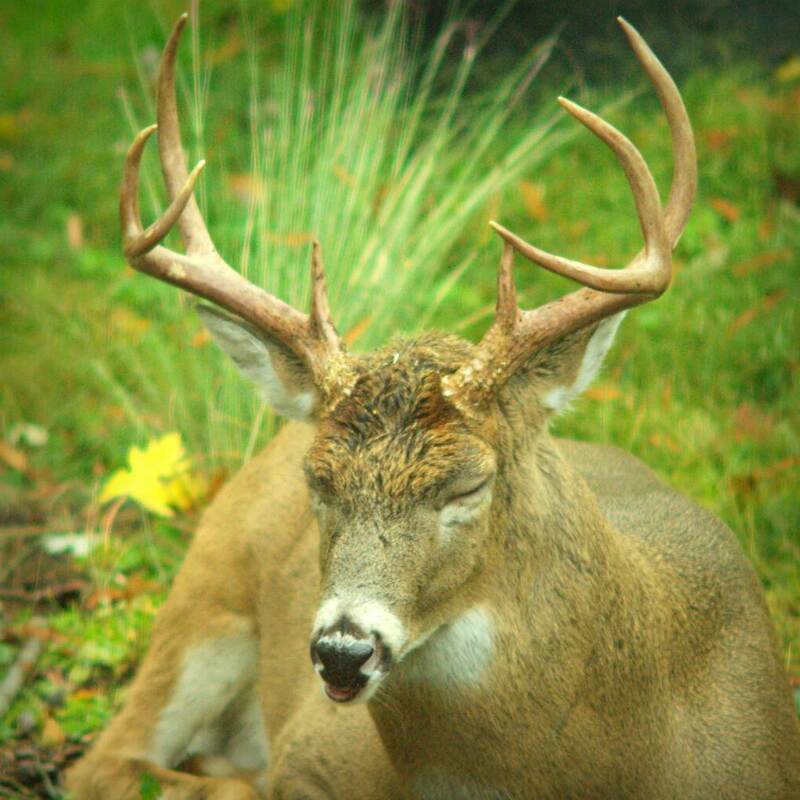 Bucks slow down their feeding tremendously around this time and will often lose a significant percentage of their body weight from the constant effort of searching for estrous does. Those are 2.5 year olds (maybe 3.5). It's hard to tell without a full side profile of their bodies. Great pics! Wow Alan, those are some gorgeous photos! Wonderful, Allen. 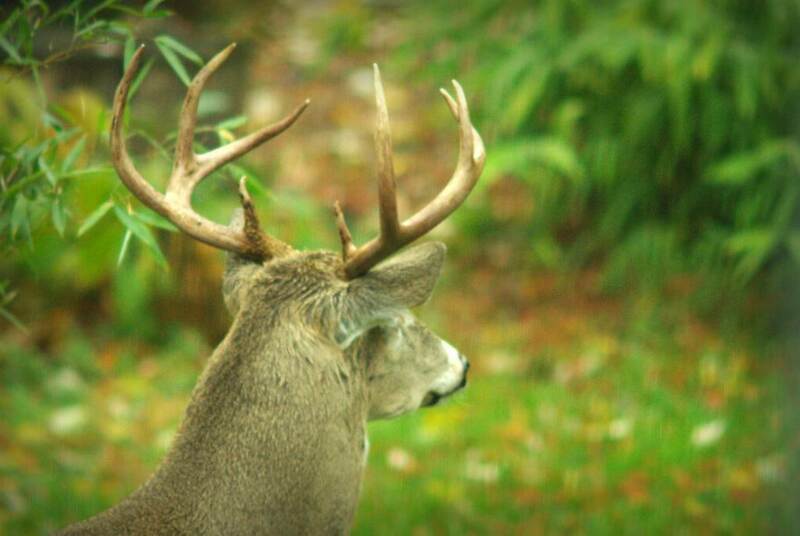 It's considering God's willing that you can view the deer at such short distance. If in my country, I doubt they will end up in "soup"..
By the way, it's so beautiful. It made me "chuckled" by the way you described your ROSE!!! as I love to see the real rose.. hahaha..
Dew: I used my telephoto lens, so I didn't need to get very close -- just took photos through the windows. Wonderful photos! A telephoto lens is on my wishlist now. 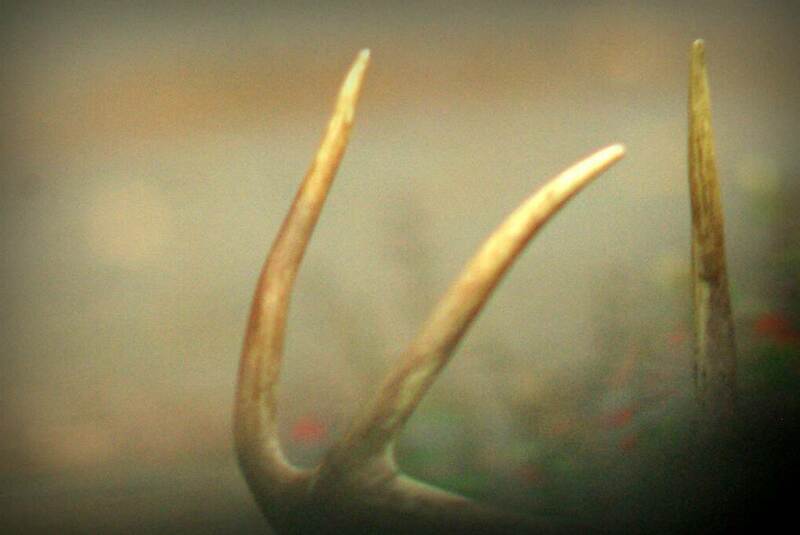 If you find dropped antlers later on, they make great dog chews. Hoover: I'd be so excited if I found antlers. They'd get mounted decoratively for sure! 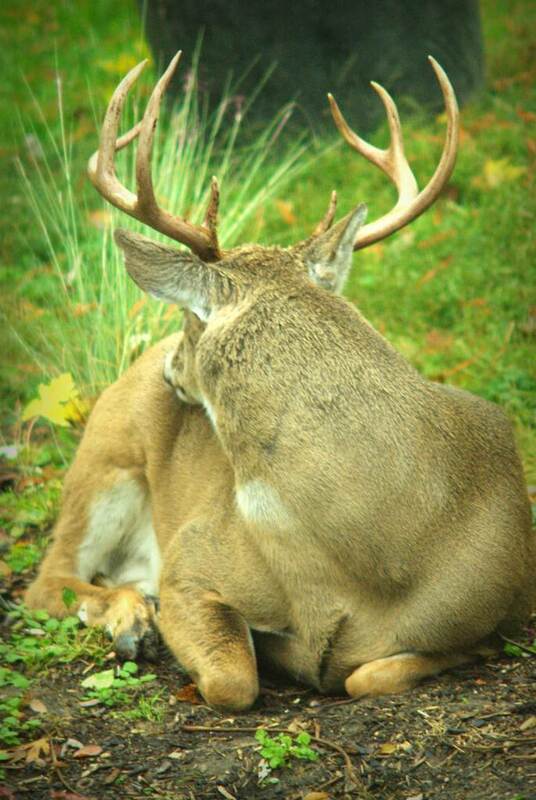 It's rutting season, so likely he got in a battle with nother buck. Hence the bloodied fur and dazed look. Those fights can be quite vicious.